Last year is when I truly immersed myself into Blogging, and with it came many benefits and opportunities that I could not have dreamed of! I was no longer simply keeping an Online Diary about my journey of Motherhood or the milestones my Son has reached, though this is still very much the focus of this blog. I am now part of a tight knit community of bloggers, enjoy engaging with a loyal community of my “readers” who are more like Friends, and have been blessed to collaborate with some great brands! If I had to summarise the second year of Blogging in ONE word it would be SOCIALISE. The number of like minded people I have met, socialised with, and been lucky enough to now call my friends is the greatest thing that has come out of last year. As Mums around the world will know, Parenthood can be lonely, especially when you leave the corporate world, and are faced with driving toy diggers on the floors all day. Making the decision to be a Stay At Home Mum is the best decision I ever made, but it can also be lonely. Therefore, being able to make friends and have actual adult conversation rather than shout “No, Don’t touch that!” all day is revolutionary and very welcomed. The last year of my Blogging Career also saw me work with some excellent brands such as BabyShop Arabia, and contributing to the likes of Huffington Post UK and Musafir.com. I am also proud to be associated as the Brand Ambassador for Palmers ME, MumzWorld and The Music Monkeys. I have met so many inspirational women through the Local Flair Feature, each of them with an extraordinary tale of how they built their business empire. Talking with them about how they manage to juggle both their business and full time role as mother has been awe-inspiring. I have shared with you milestones such as Potty Training my 2 year old son, and experience of Umrah with my family in the last year, as well as flying to India after a DECADE, this time as a Wife & Mother. Likewise, I have been able to share with you my reaction of The Cursed Child script, having read it in a day. I have had opportunities to visit the hip and happening places in Dubai, whether that be restaurants that offer you Liquid Nitrogen as part of the dining experience, staycation in to the capital city of Abu Dhabi or a family trip to the amazing Legoland Dubai! I shared with you my Hijab Story and my day to day diary during Ramadan. I have been able to give back to you through Social Media Giveaways, and hope to carry on doing so in the next year. Most recently, I made my debut on Youtube, and received great feedback for it too! The past year has been exceptional, and I want to thank each and every one of you all for joining me on this beautiful journey. Thank you for every single like, comment, follow, hello, wave, hug and appreciation that I have received from you all, spurring me to carry on producing creative content and sharing my tips or experiences with you. Here’s to Mummy On My Mind’s THIRD year being even Bigger & Better! 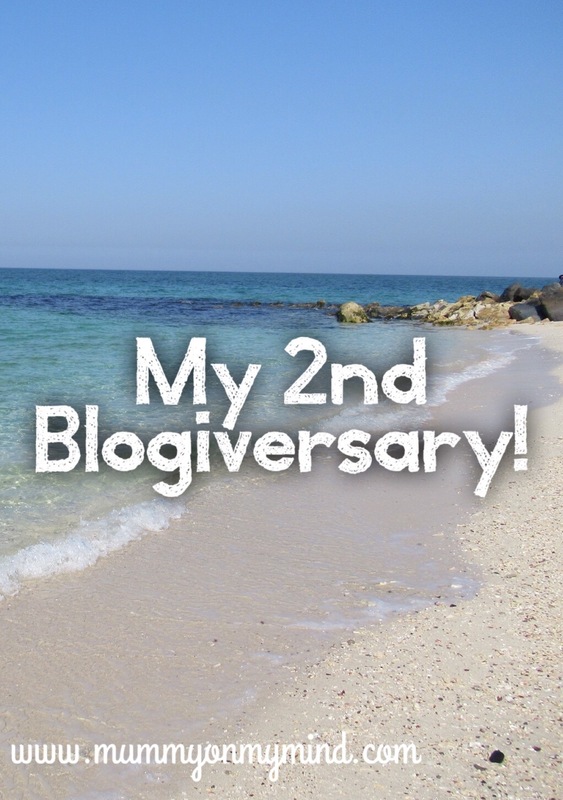 Happy blog birthday, mine turned two on the 13th and I have no idea where the last two years have gone! Thank you and Happy Blog Birthday to you too! You’re right, time has flown by so quickly!! Thank you so much Shea for your kind supportive words. I am so happy to have found my blogging tribe from whom I can learn so much! Congratulations again! I particularly adore your commitment and the manner in which you keep churning out posts one after the other. Above all, the alhamdullilah series is my favorite part of your blog. Thank you Priyanka for your support and generous comments about the blog. I really enjoy writing the Alhumdulillah series too, and so glad I started it! Thank you so much for your support and kind words! I really enjoy writing the Alhumdulillah series too! Congratulations Zeyna 🙂 It’s been a wonderful 2 years for you! You deserve the overflowing of success in your career and personal life! So proud of you, keep it up! Happy bloggy birthday Zeyna! I just know the next year is going to be an awesome one for you!